When I told my kids that Alden Richards will play the role of a new Filipino superhero as “Hammer Man” in GMA Network’s VICTOR MAGTANGGOL – the two laughed like there was no tomorrow. I am so glad that the title “Hammer Man” amuses them and I too saw it as a very silly name for a superhero – but after watching the pilot episode of Victor Magtanggol last Friday at Cinema 76 of Super Metro Mall Anonas – I am convinced, that the “name” is the ONLY thing silly about this series. This series, if same production quality continues with the rest of the episodes, may in fact be one of Direk Dominic Zapata’s best project yet in the Fantaserye category. I had my biases before watching the pilot – I have seen the social media comments about these series. While I am not deeply offended with local series that copies popular franchises, I however see it as something that diminishes the credibility and creative capabilities of local writers, talents and TV production people. And you can’t really blame pop culture fans to get offended when they see something that is really identical to shows that they really love and see the copycat as just a rubbish money-making scheme with low production quality. GMA Network in particular have been criticized in their previous shows such as Alyas Robinhood which netizens attributed to be as a copycat of “Arrow” while The Cure on the other hand was seen as something similar to “The Walking Dead” – and naturally, if you create a Pinoy superhero that wields the power of the Mjolnir (Thor’s hammer) you’d think that this is going to be a rip-off of Marvel’s Thor and the Avengers franchise. At first look it is, but after watching the pilot episode – I believe that the story deserves a chance to be seen. I was really surprised, because while I did not enjoy the graphics so much (but it was an improvement from their past CGI rendering) I thought that the plot was actually pretty interesting and ORIGINAL. You heard me right, it’s an original concept and so credits to the writers of this series. Victor Magtanggol is loosely based and inspired by Norse Mythology and in events that happened after Ragnarok (not the MCU movie) – actually, the story is far from what MCU offers its audience. While the myth interpretation is not a 100% similar to what is written in the books, the one that the series followed is closer than what Marvel has conjured to bring to life their superhero character Thor. Victor Magtanggol has more heart. 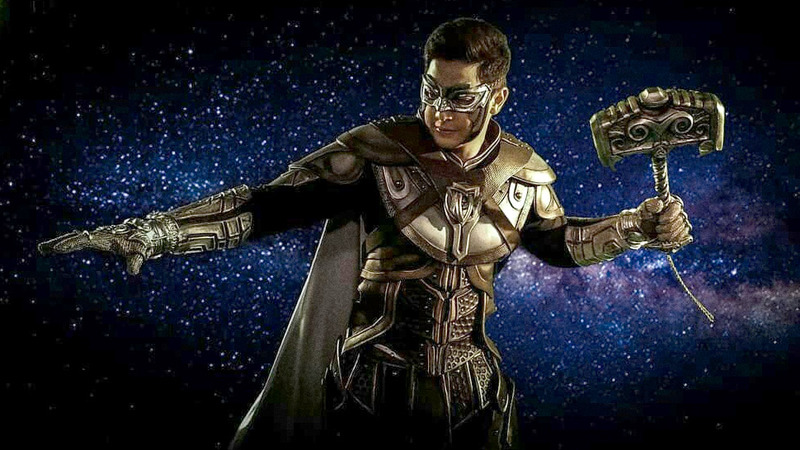 More than a Fantaserye and Pinoy superhero action series, the story of Victor Magtanggol talks about family, love, hope, doing what is right and being responsible. I have always thought of Alden Richards as one of GMA Networks’ most promising actor – a real gem. I so loved his performance in Yam Laranas’ “The Road” – his acting career got sidetracked after being paired with Maine Mendoza for the phenomenal love team #AlDub born in the noontime TV show Eat Bulaga in 2015. And now that he’s back to serious acting again, I believe that he’s going to rake more awards soon. In the pilot episode of Victor Magtanggol I saw the Alden Richards that I knew 5 years ago – serious with his acting craft. Every dramatic sequence in the first episode is an instant tearjerker. He’s perfect for this role. The theme song “Superhero Mo” of Ex Battalion and Alden Richards is screen-perfect. The upbeat and yet emotional pop-rap tempo is an easy LSS especially when they use it appropriately in uplifting sequences. My biggest vision for this series is that GMA Network is probably gathering characters for an explosive series in the future that will feature characters from all their previous Fantaseryes like Mulawin, Encantadia, Tsuperhero, Super Ma’am, Alyas Robinhood, etc. – that’s another silly idea but hey, anything is possible. VICTOR MAGTANGGOL tells the story of Victor who will later be chosen as the one person to inherit the powerful hammer of Thor and the gauntlet that controls it to help protect Midgard (Earth) from the evil forces of Loki – the God of Mischief. I hope that they use “Hammer Man” sparingly in the series because my kids will not stop laughing – but like I said, that is the only thing that’s laughable about this series. The rest will be about Alden and the casts’ wonderful performance! Maybe people should give this a chance, Direk Dominic Zapata is a very capable director – let’s all see how this story unfolds. We all know that it’s not going to rival big budgeted US series anyway – so let’s see if the story and acting has merits first before we give our verdict. CATCH THE FIRST EPISODE TONIGHT (JULY 30) ON GMA TELEBABAD AND TELL ME WHAT YOU THINK. Is this a paid article? Like an you’re an influencer type?